The Ebac WM80 dehumidifier is a medium capacity dehumidifier designed for commercial and residential use. It provides all the advantages of Ebac technology in a robust yet compact package capable of free-standing operation or wall-mountable for added convenience. This is an ideal unit for use in demanding domestic environments and perfect for small to medium sized commercial premises where wall mounting is the preferred option for installation. The Ebac WM80 dehumidifier is a robust and durable unit. The chassis and casing are of rugged steel construction for a long and reliable service life yet the unit is of pleasing appearance that will not look out of place in a wide variety of commercial and domestic locations. Applications include offices, apartments, stores, restaurants, bars, salons, museums, storerooms, computer and telecommunications rooms, garages, cellars, animal enclosures and spa rooms. Equally important the Ebac WM80 is an energy efficient dehumidifier which benefits from the low amp draw (2.5amps in operation) made possible by its high efficiency rotary compressor. A high performance cross-flow fan also contributes to that efficiency and enables the unit to operate quietly, with a noise output of 58dB. The WM80 is a powerful unit with a water extraction rate of 56 pints per day at 80°F and 60% relative humidity, the standard set by the Association of Home Appliance Manufacturers (AHAM) for comparative tests between dehumidifiers. In more extreme conditions this unit can extract up to 120 pints per day. This capacity enables the unit to dehumidify an area of up to 1500 sq ft (manufacturer's recommendation). The WM80 is well equipped for low temperature operation by virtue of Ebac's hot gas defrost technology. 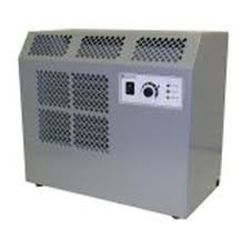 All dehumidifiers suffer from ice formation on the refrigeration coils in ambient temperatures from around 65°F which, if unchecked, degrades their performance and limits their effectiveness at lower temperatures. With the hot gas defrost feature the WM80 can operate at temperatures as low as 33°F and retain full performance. The capability for low temperature operation can be important for commercial premises which are located in areas subject to low temperatures and may be unoccupied and unheated for hours or days. For domestic users this can also be an advantage in more challenging areas of the home such as a basement or a garage. The Ebac WM80 provides two options for installation, free-standing or wall-mounted (bracket supplied). In either mode this unit is compact and requires very little space. Its external dimensions are only 19.3 x 22 inches, height and width, and a very slim 11.3 inches in depth. Wall-mounting the appliance offers obvious advantages where floor space is limited, a garage or retail outlet for example and may be particularly attractive in some commercial premises to ensure that the unit is safely out of reach of curious kids. Precise control of humidity may be important in some commercial applications and will certainly be so if the unit is used in a garage to protect a classic car. An adjustable humidistat allows a preferred level of relative humidity to be programmed and the unit will then maintain that level automatically. The humidistat simply cycles the machine on when the humidity rises above the programmed threshold and cycles it off again when it is returned to the chosen level. This is also an energy saver which benefits all users. The Ebac WM80 is also equipped for continuous drainage by means of a gravity feed. Provided that a nearby drain is available at or below the level of the dehumidifier this ensures that the dehumidifier can operate unattended as no water container will have to be emptied. If there is not a suitable drain available an internal condensate pump can be specified as an optional extra which will carry the water to a more distant drain or to an outlet at a higher level.